Marrakech--- 'Saratan' by director Ernest Abdyshaparov (Kirghizistan) has won the Golden Star prize at the Marrakech International Film Festival, held in the Moroccan southern city on Nov. 11-19. The closing ceremony of the festival was also marked by a special tribute to the Iranian filmmaker Abbas Kiarostami. The director of 'Saratan' was handed over the trophy of the festival's Grand Prize by Italian actress Monica Bellucci. The film is a set of stories about the inhabitants of Kirghiz village during the ten years following the fall of the Soviet Union. The film talks about tragicomic tales of politics, tradition, modernity, pride and honour. The best male acting prize went to Daniel Day-Lewis for his role in 'The Ballad of Jack and Rose'; the best female acting prize went to Shirley Henderson for her role in 'Frozen', and the Jury's prize went to both 'Crazy'(Canada) and 'Bab el-Makam' (Syria). 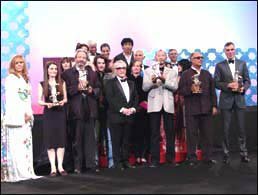 The closing ceremony was also marked by a vibrant tribute to Iranian filmmaker Abbas Kiarostami, one of the true masters of contemporary cinema. He was handed over the trophy by legendary US filmmaker Martin Scorsese. Kiarostami has won not only the admiration of audiences and critics worldwide, but also the support of directors as distinguished as Jean-Luc Godard, Nanni Moretti, Chris Marker, and Akira Kurosawa, who has said about Kiarostami's "extraordinary" films: "Words cannot describe my feelings about them and I simply advise you to see his films... When Satyajit Ray passed on, I was very depressed. But after seeing Kiarostami's films, I thanked God for giving us just the right person to take his place." Kiarostami emerged in the West as a major filmmaker in the early '90s, with films like 'close-Up' and 'Through the Olive Trees'. Kiarostami has made more than 20 films, including fiction features, educational shorts, feature-length documentaries, and a series of films for television. He has also written screenplays for other directors, most notably The White Balloon, for his former assistant Jafar Panahi. He was honored with a retrospective at the Film Society of Lincoln Center, New York, and he came to the Cannes Film Festival at the eleventh hour with Taste of Cherry, only to walk away with the Grand Prize, becoming the first Iranian director ever to win the Palme d'Or. The festival has also paid tribute to other acclaimed directors and actors such as Martin Scorsese (US), Amidou (Morocco), Yash Chopra (India), and Saif Ali Khan (India). The film festival has also paid a special tribute to the Spanish Cinema with the screening of a total of 41 films, emblematic of the Spanish film production of the past fifty years. The festival has attracted a fair smattering of European and Asian stars, including Catherine Deneuve, Judi Dench, Terence Stamp, Daniel Day-Lewis, Monica Bellucci, Yash Chopra, Martin Scorsese, Vincent Cassel, Maggie Cheung and Rebecca Miller. The festival opened on Nov 11 with a screening of Stephen Frears' 'Mrs. Henderson Presents' and closed on Nov 19 with Enrico Oldoini's 'Thirteen at a Table' (Tredici a tavola).